The Gefen EXT-VGA-CAT5-148S is a 1:8 VGA CAT5 Distribution Amplifier which allows you to send one source to multiple displays in remote locations at the same time. This CAT5 Distribution Amplifier has eight RJ-45 output connector and one VGA input. The RJ-45 connectors are connected to up to eight VGA CAT5 Distribution Amplifier receivers using industry standard CAT5 cables. The receivers can be placed up to 330 feet away from the transmitter. 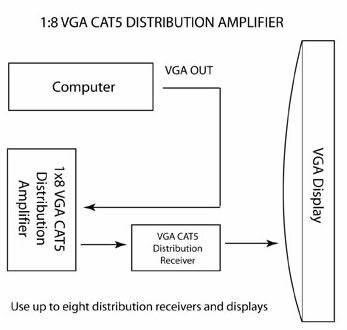 Simply connect your VGA video source to the 1:8 VGA CAT5 Distribution Amplifier's input using the supplied VGA cable. Then connect up to eight VGA displays to the VGA CAT5 receivers. Power the 1:8 VGA CAT5 Distribution Amplifier and the receivers will get power from the CAT5. Note: VGA output 1 is the primary connection and is used for the main display. VGA output 2 through 8 follow the main display. The VGA displays attached to the 1:8 VGA CAT5 Distribution Amplifier MUST have the same native resolution in order to get a picture. The 1x8 VGA CAT5 Distribution Amplifier will also extend a component signal or composite video w/ L+R analog audio. For this to work, you will need a VGA to Component Cables and a VGA Female to Female Adapter.